Welcome to Sapphire Falls! It might be a fictitious town in actuality, but it feels very real to me. So real, in fact, that I can visualize all of the places vividly in my mind as I write about them. I wanted to somehow bring readers pictures of the town and the places—from the Come Again bar to Scott’s Sweets to the favorite make-out spot—that they have fallen in love with as they’ve read the series. So… I commissioned an artist to turn my sketches into actual drawings! By why stop there? You all are an integral part of this town and I thought it only appropriate to let you give it some of your own color—literally! 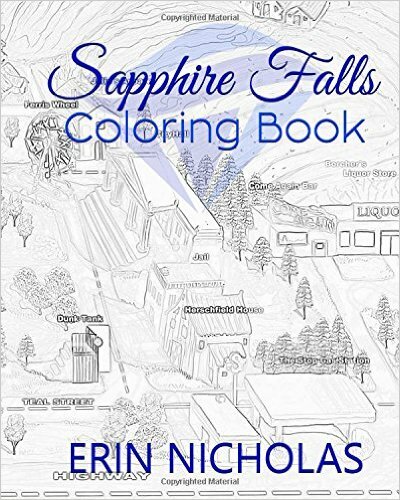 I hope you enjoy the Sapphire Falls coloring book! Seeing this town come to “life” in pictures has been so much fun for me and I hope it will be for fans as well! So, grab some colored pencils, markers or crayons and take a trip with me through one of my favorite little towns!